This is the owner of J & T Military Surplus. We are proud to announce that we are expanding our Airsoft Field from it’s current size of 3500 sq ft to 9000 sq ft. We are adding new courses and have expanded our playing hours. The new fields are scheduled to open August 17th, 2007. In the meantime enjoy our current field. J & T Military Surplus is the premier indoor airsoft facility in Southern California. We have been successfully running our field for 2 and half years. We are by far the most experienced airsoft field in the area, and have been innovators in ways to play the game of airsoft. Our Entry fee is $20 a day, but for the months July & August we have reduced our rates to $5 a day. The first 60 people each night get this special rate. Field Chrono 350/FPS w/.20. Must play with Field Ammo only. We’ve posted up last night’s broadcast for everyone to enjoy is now available for download via iTunes (search for “opsec” in the Music Store) or via direct download at the below link. We have had an increase in the volume of phone calls recently in regards to our sale. The reoccurring question that seems to be on everyone’s mind is, “Why are you only giving way guns to your walk-in store customers?” We didn’t have a good answer, so we thought about it for a while, and here is what we came up with. Throughout the month of July we will be GIVING AWAY merchandise to you, our valued customers. There will be a drawing once a week from all of the online order numbers from the week prior. The grand prize drawing will encompass the entire month of July. The more often you buy the more chances you have to win! 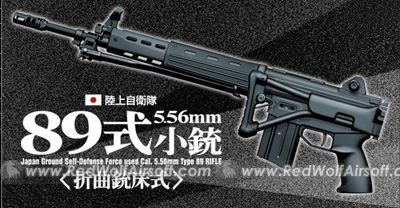 Tokyo Marui Type 89-F – It’s the Type 89 with a folding stock. 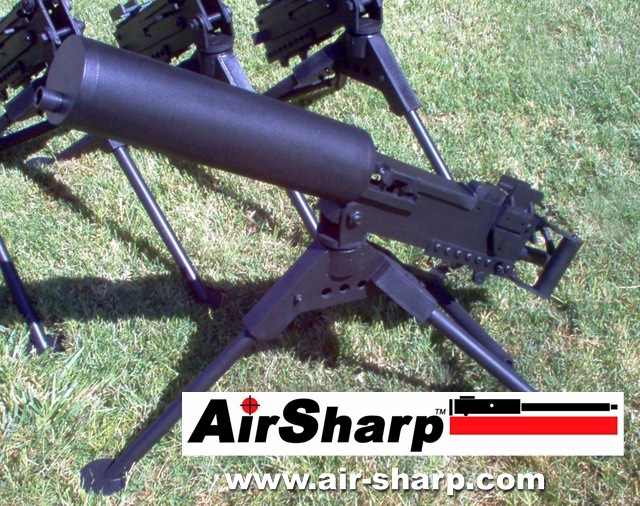 The real gun equivalent is used by AFV crew and Paratroopers. 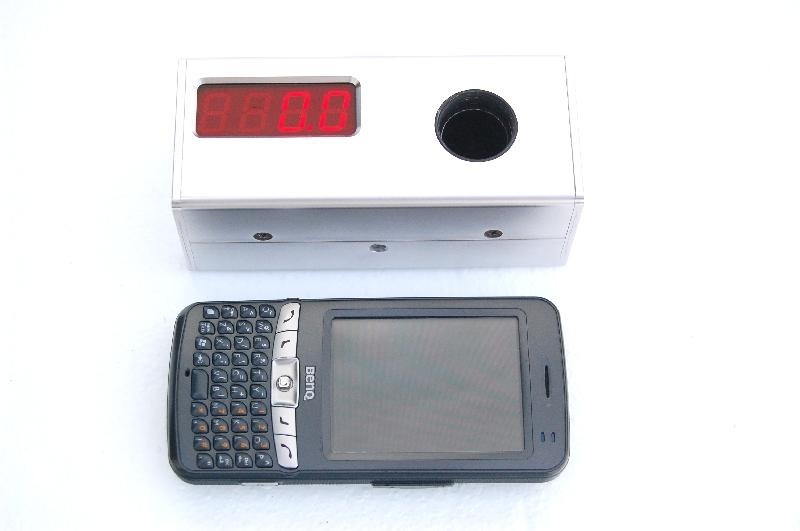 This Marui version will have the Version 8 ‘box with the 3 burst mechanism. Click here. Maruzen P99 Fixed Slide Set – Ok, so this is not so much a new product, but Maruzen will be re-releasing their venerable fixed-slide version of their much-loved P99. Click here. 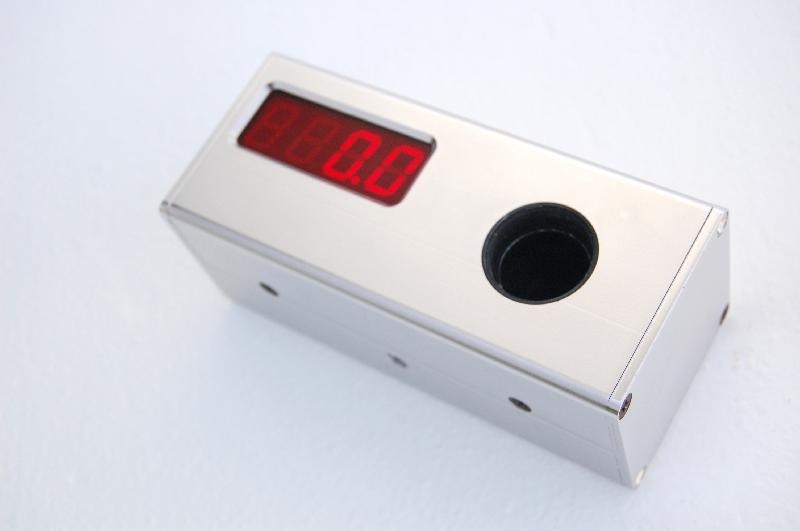 Then, just a brief update on the Airsoft Surgeon Slugshot – there’s been quite some interest in the product. The slugshot shells have just been released, along with the slug ammo. The shells come in a box of 5, while there are two versions of slug ammo: first there is the 1.9g type A and then there is the 3g type B, both come in a bag of 50. Shortly, we will be expecting spare O-rings for the slug shells, which are made in Germany to ensure the highest quality. For Airsoft Surgeon Slugshot shells and Slugs click here. Please note that these shells can only be used with a custom-made Slugshot gun from Airsoft Surgeon, which are available here. Pictures attached (editor’s note – inserted above). Latest NEWS – Online Retailer of 2007. FireSupport have won the AI Magazine readers survey for the Online Retailer of the Year. We would like to thank all those customers that voted for us. 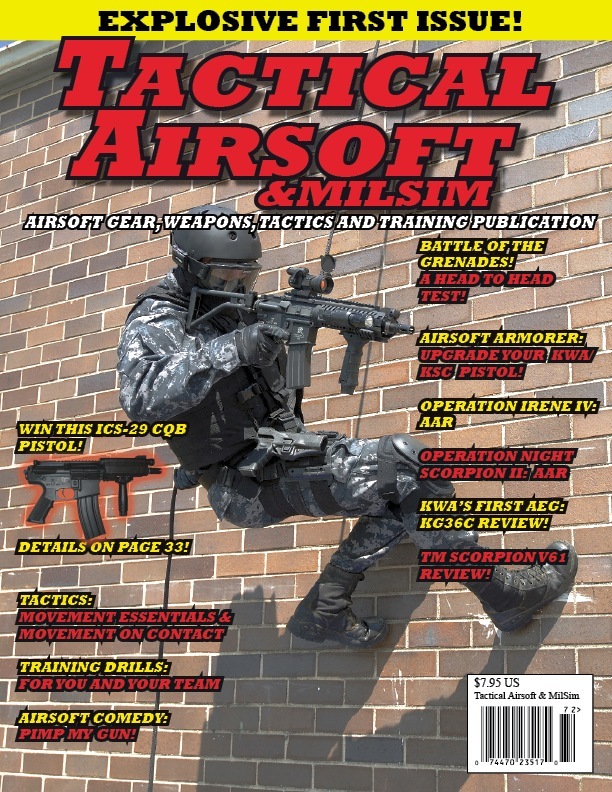 Tactical Airsoft & MilSim, a brand new full color magazine printed in the US will be out July 15th. You can order yours today at www.tacticalairsoftmagazine.com! Tactical Airsoft & MilSim is the only full color US Airsoft Publication. Their focus is on the Military Simulation and Tactical Side of the sport. 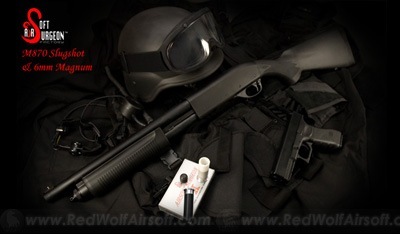 Tactical Airsoft & MilSim covers airsoft news, weapons, gear, tactics, training, and even airsoft comedy. If you are serious about airsoft, you will definitely want to check out the newest airsoft magazine on the market! We finally done the testing. Everything runs very well. We estimated that we can release this item in 1 month. Retail price will be less than $100. 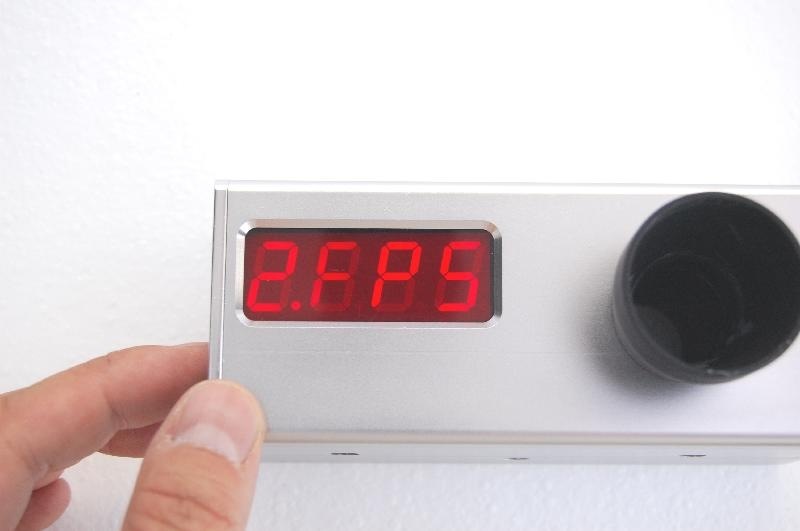 Using the latest patented technology: Muti-angle measurement. Better than anyone else in the market. 9 Volt battery. Auto turn-off in 2 mins. As of this issue Ai is delighted to announce that Action Sports Games have become our exclusive Airsoft Trade distributor to Europe (Except the UK). This is great news as it means that Ai will be available for the first time the the European Airsoft Trade market. We have also received our test sample of the Army R85 (L85 A1). We are very impressed and looking forward to receiving the rest of our shipment next week. Also coming soon we?ll have the Kart Soc16, Double Eagle UMP, FN 2000 & a full metal CQB SD. New Dorking Skirmish Site – Chris Ryan there this weekend! Elite Action Games are pleased to announce the successful launch of Dorking with over 90 players turning up for the opening on the 17th June. It was a fast a furious day with assaults on the US styled Command Post (CP), across the paintball village and fort and several other gaming areas. From the posts on forums, players loved the sited. Just like to take this opportunity to thank all those that came along and hope they enjoyed the day and the free raffle. Obviously we are still working hard on the new safezone and various other scenarios to vary the days play. Currently there has another 1000 sand bags to be put up around the CP and plans for the VC village are coming along. Still no further news on the 432s and the Chinook bodies, but we will keep you posted on that front. Lastly, Chris Ryan of ?The one who got away? fame and obviously one of the few known SAS operatives will be at Dorking this weekend (1stJuly) running 100 people over the assault course at Dorking. There MAY be an opportunity to meet him at lunch time or after close of play. Montenegros Desert Storm VI: Major Spanish Skirmish this weekend! Monegria and the countries we all know can?t get the peace so easily, even when the last event left some order and got the invaders thrown away from the free Monegrian Republic there is always something to care about in this arid desert? We do know that Spanish players are not afraid of dust, wind and enemies, but are they capable to face the desert sun with temperatures raising fast up to 40 Celsius degrees? Well, the answer has been told to us a few times and we know they can use their mind and strength their bodies, but they also can like fresh drinks and some shadows, we got a perfect compromise this time. This edition, seen the nice idea night games are, will have a new torque, during the hot hours in the day we will have crony target range, team battles, sniper search and the usual competitive tasks to let everyone get clear if they rock or not; and for the night time we got a non stop game from about 18:00 in the Saturday to 10:00 on Sunday, there will be no peace for all the night and any electronical device is authorised. But if you want to know more, we have more for you, this confrontation is held with all the help from the Spanish Airsoft Federation and according to it?s rules, as part of the national airsoft circuit being organised, we also will have the sponsors that have been supporting us and some new ones, Sherman Survival, the best known airsoft store has more than never (if an XM8 is not enough for you), Altus, number one in military and civil equipment in Spain will take here some free stuff including combat and civil first class and airsoft-proof garments, ASOLO another airsoft supplier will take it?s first step with us, Schweppes has a whole deal for us to get fresh drinks and shadowed places to have a rest and War Heat, the magazine, is starting the collaboration, don?t pass the opportunity to become famous!. Of course all this organization could not be held without the Tardienta-Monegros adventure centre that has been giving us a place to enjoy all this time and the main piece in the game, PLAYERS that confide in us event after event. 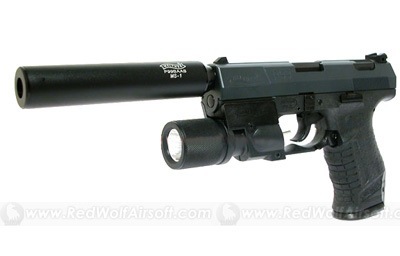 Yeah, this sound really good, but there is also a place for players; an expert ?airsoft gunsmith? will be here all weekend to help you fix, upgrade and shim your material, players have a place to deal without post cost and we got the biggest deal, we got funds to hire a full moon!! Yes, if you don?t have a night scope we fixed it for you! Want to know more about The Spanish Airsoft Federation (aka Federacion Espenola De Airsoft)? If so click on the read more button for a letter from its president! Get it first on Arnies! The first English review of the much-anticipated CYMA Thompson is here! NAM magazine Issue #14 out! The 14th Issue of NAM is out now! We know what you’ve come to expect. Never willing to compromise, we’ve delivered yet another issue packed to the gills with the quality content you’ve come to enjoy. See what it’s like to play at Tokyo Marui’s CQB Arena in Japan! 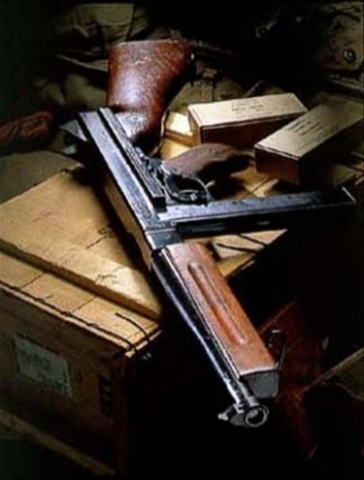 Although it’s by far the most utilized weapon in the world, how come the AK gets no love? Arnie of Arnie’s Airsoft joins us in The Interrogation Room. Does airsoft make you a better soldier? Hear what one soldier from Afghanistan has to say. Just how safe is swapping out those .20s for .12s to nab that extra boost? Trust us when we say you’ll definately be talking about this one. MGUYA 2: Metal Gear Up Your Arse-nal returns with even better prizes! 100 PAGES OF 100% AIRSOFT! at the same ol’ price! Simply click the link below to nab your copy today! And remember…players that don’t know, don’t. Players that do, read The NAM! £7.50 a bag or £5.50 a bag if you buy by the box. 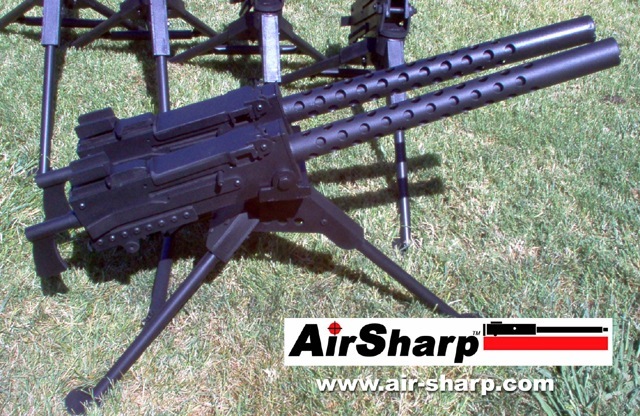 We have recently added a dual-gun model, two air-cooled 1919’s together on one pintle/tripod, with two ammo drives. A total of 10,000 rounds without reloading! Optional barrels and grips are now available. 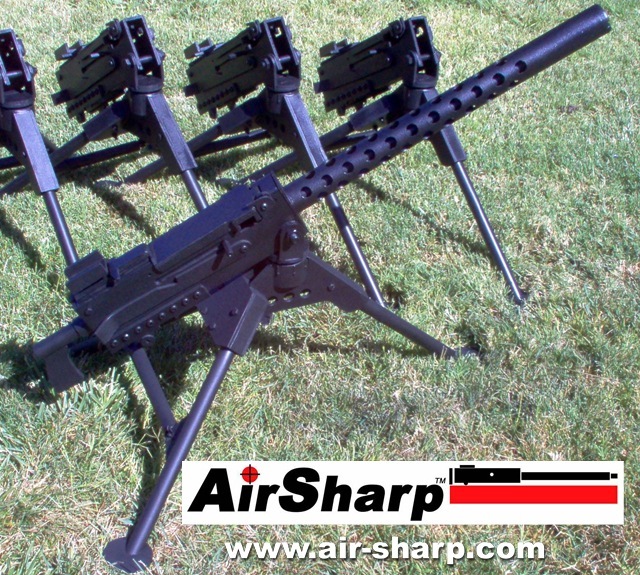 Our guns can be swapped from water- to air-cooled barrel, or pistol to spade grips, in the field, without any tools! Link to out latest demo video. 16megs, but fun to watch .